Audiences are invited to meet in a secret location later this month to embark on the captivating theatrical journey through the back streets of Hull in Home Town Story. Hear poetry from voices that shout from the rooftops, whisper round corners and echo through the squares in this brand new site-specific commission from Absolutely Cultured, which is part of this year’s BBC Contains Strong Language. Written by award-winning poet and playwright Louise Wallwein and directed by acclaimed director, writer and designer Mark Murphy, Home Town Story features a cast of Hull’s finest poets, wordsmiths and actors, including Russ Litten and Women of Words, as well as visiting poet Zena Edwards, who will all bring the story of the city to life through poetry and performance. Katy Fuller, Creative Director and Chief Executive at Absolutely Cultured, said: “Building on the success of last year’s inaugural festival, we’re delighted to once again be partnering with the BBC and Wrecking Ball Press to produce the return of the BBC’s national poetry and spoken word festival Contains Strong Language. 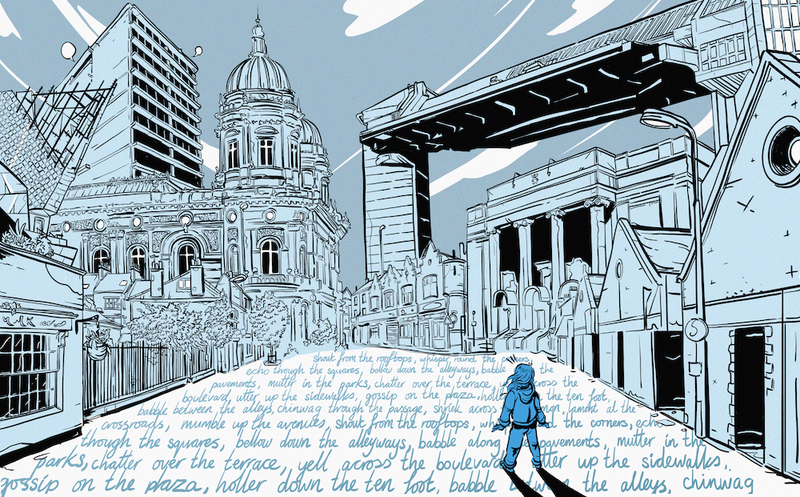 “As part of this year’s programme we’ve commissioned a new outdoor piece, Home Town Story, which will offer the audience a playful journey of discovery through the city, punctuated by encounters with poets, beautiful design and performance. “Hull is a city of words and last year’s festival proved there is an incredible appetite for spoken word and poetry in the city. We’re really excited to bring this original piece of work to Hull and to be featuring local people, as well as local and nationally renowned poets and theatre makers. Mark Murphy, Director of Home Town Story, said: “This is the first performance I will have directed in Hull and I’m proud to be taking part in the legacy of City of Culture, to be part of the next chapter and to help build on the success of last year. Home Town Story runs from Friday 28 until Sunday 30 September 2018. Performances will take place each day at 1pm, 3.30pm and 5.30pm, with BSL interpreted performances at 5.30pm on Friday 28 September and 1pm on Saturday 29 September. The secret location will be revealed to ticket holders a few days before the show. Tickets are free and can be booked via the Event Brite website.